In 2013, I hosted a tea party celebrating the 75th anniversary of Orson Welles’ reading of “The War of the Worlds”, which was broadcast on radio stations nationwide. I have a copy of that reading and played it throughout the tea party. The reading took place in 1938, so naturally I wanted an authentic table setting for the period. What better to use than vintage Fiesta? 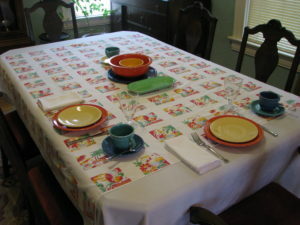 Of course, I used newer Fiesta for the place settings, because I don’t have vintage ones in my collection. However, I did use newer pieces that, while not exact, mimicked the original colors offered in Fiesta. Persimmon (close to vintage red) luncheon plates (Herberger’s) were for the savories and sweets, while P86 Yellow (close to vintage yellow) served for the scone course (The Bon Marche in Great Falls, no longer in business). Alternating turquoise (close to the original) and lapis (close to vintage cobalt) tea cups and saucers held my beloved Autumn Haze tea blend, no longer manufactured (cups and saucers bought at Herberger’s). Berwick stems by Anchor Hocking held water (thrift store), and flatware was Bradford by Cambridge Silversmiths (Herberger’s). The tablecloth was a white linen look hemstitched one with matching napkins (Walmart) and a cotton overlay of a tablecloth depicting Mexican scenes-found earlier that day at a thrift store and perfect for the Fiesta plates! The centerpiece featured my modest collection of vintage Fiesta. The most special is the vintage turquoise creamer. It belonged to my Grandma O’Donnell, but she didn’t care for the color so that’s why I have it. The vintage red bowl has some severe chips on the rim, but I still love it and use it occasionally. I used my Fiesta Seamist teapot to serve the tea, but won’t use it again as the round handle is simply too difficult to use when pouring tea. My 75th Anniversary of Orson Welles’ broadcast of The War of the Worlds, featuring Fiesta, with some of my vintage pieces as the centerpiece. We had a great time!